Alex Caputo-Pearl introduces the UTLA study. LA Unified board members asked Tuesday for an in-depth analysis of a union-funded report stating that the district loses more than half a billion dollars because of independent charter schools. A response from the California Charter Schools Association, delivered after an hours-long recess while the school board met in closed session to address litigation against the district, called the union’s “scapegoating of charters” an “incessant tirade” and noted that the district faces far bigger financial threats than charters. 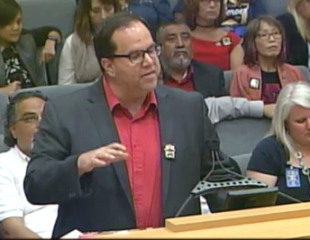 The study on the fiscal impact of charter schools was commissioned by United Teachers Los Angeles because of the enormous cost issues facing the district, said UTLA president Alex Caputo-Pearl, who gave school board members the report in folders in the union red color. The report includes direct and indirect costs on the district, including the staff and office space at the Beaudry district headquarters for the charter schools division. It also includes expenses on services to disabled students, costs related to enrollment and the loss of tax money. The study estimates that the costs to the district of money intended for traditional schools totals about $18 million annually and is growing every year as more independent charters are approved in the district. LA Unified has more charter students than any other district in the country, with 101,000 students in 221 schools, making up 16 percent of the district enrollment. Over the last decade, the number of charter schools has more than tripled. “We are bleeding money and if we cut staff we don’t have health benefits because we won’t have the active employees to pay into it. You cannot support programs when you are losing enrollment,” said board member Richard Vladovic. Angel added, “UTLA’s goal of blaming charters for the district’s complex financial challenges is especially irresponsible when you look at the big picture. The district’s own experts and its independent financial advisory panel have already identified numerous issues that are much bigger than charters, some of which you’ve discussed today. And, I know those discussions will continue, even as UTLA continues to draw your attention away from the deep and complex issues that have nothing to do with charters. Board member Monica Ratliff asked to have district staff analyze the report and give them details at an upcoming special budget session. Tax money goes directly to the independent charter schools and follows the students, so if enrollment declines, so does the funding. 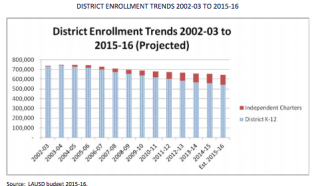 That results in a decline of more than 7 percent of the district’s core budget per year. The district could lose about $4,957 per student, according to the study. The charter school division spends $2.9 million more than the available funding on monitoring and helping independent charters, and routine audits can cost an average of $70,000, the report says. It states that there are 46 staff members at LA Unified in the charter schools division.